What do you think of this idea for an entrance/exit? I quite like this; I'll tender my support for it. While glacial arcs are cool, it would be hard to place them. I imagined the ditches dividing each glacier to be 10-20 blocks apart, so it'd be hard to fit in. Also, would the lower nitrogen sea become a major feature? If so, they may contradict with the Misty Sea. I choose obsidian because quasi-lore says obsidian is key to interdimensional travel. The Frist Warper has an appearance similar to that of an end portal block. The Warper requires an iron block underneath it to operate, this ensures it is not used as a mobile teleporter. When sneaking on the warper, a beam of rainbow light comes down form the sky and you taken to the Frist. However, the Warper has several flaws. First- you cannot take other mobs with you. Second- it takes you to a random location every time you warp within three hundred blocks. But most important of all- the Warper is a one way trip. The only way to get back to the Overworld is by crafting Crystal Keys (or trading for them with Tundrans). Crystals desperately need a use, and this would accomplish it. The one-way ticket system would also encourage the creation of a Frist base, as each journey to the Frist feels like stepping into a whole new world with no purple portal to save your back. It also encourages the use of the second method- glacial arches. Rare glacial arches would exist similar to how Wolftopia described them but, must be activated with a Heart of the Frist. They would spawn only in the Glaciers of the Overworld and the Misty Seas biome (not the bottom of the Frist). This would allow you to sail large ships into the Frist, bringing lots of materials and mobs with you. The arch method allows for constant traveling in and out, however, you wont be able to go to the Frist quickly or within the comforts of your own base. One of the Engineer schematics would be the ability to craft an Overworld Warper, which allows for quick and constant travel between Overworld and Frist. To summarize- I suggest there are two methods to get to the Frist. Each encourages a different style of play, granting the player more options. I don't think it'd look unnatural if the edges of the arches clipped in with other icebergs, so as long as the middle part (the entrance) was always the portal block, I think it'd be fine. I never imagined the lower nitrogen ocean/sea as something major. If that's not a confirmed feature for the Frist, what I said could be applied to the Misty Sea(s), but we should probably decide soon so there is little confusion. 1. To be unique. Both current portals have to be ignited, and having something that doesn't have this element would be more original. 2. For balance. If you're going to venture out to the frozen oceans in search of the portal, you shouldn't have to ignite it. If you did, then finding the portal wouldn't be very practical unless you wanted to bring mobs across the dimensions. The light should come out of the warper and go into the sky instead of the reverse, similar to the beacon. Small crystal particles should float around the warper. Instead or in addition to the iron block being required, there should be a requirement for ice, packed ice, or blue ice to surround the warper similar to how conduits must be surrounded by prismarine blocks. If you used ice, though, you would need more blocks than you would if you used packed ice, and the same with packed ice and blue ice. If prismarine blocks are in this radius, they should become a lighter, frozen version called "fristmarine" and should count toward the ice block requirement. Water blocks should turn into ice when near the Frist Warper to prevent players from just replacing already-activated conduits with warpers and not having to build another structure. You mentioned using the iron block requirement to prevent the warper from becoming a mobile teleporter. To further prevent this, the portal should have a very high mining duration, possibly twice that of obsidian. I like how you've proposed that we have two ways to enter/exit the dimension. This would contribute to the sandbox feel, as it isn't a direct path of progression. Also, would there still be arches in the Frist to take the player back through the arch in the Overworld? The lower nitrogen sea could be gutted, or merged with the Misty Sea biome. For the arch lighting, I agree. For the Frist Warper, the light coming from the sky was a reference to the Bifrost. But it could go either way, I really don't care. Crystal particles are cool. The ice setup would be neat. Fristmarine sounds interesting, I'll have a go at making a texture. Water blocks turning into ice is also good. I think the high mining duration should be equal to obsidian, anything more would be annoying tedious to destroy if you place it in the wrong spot. 1. Fair enough on the obsidian. Should the mining speed also not be affected by enchantments? 2. Should fristmarine only be created with this method, or should prismarine placed in the Frist itself also turn into fristmarine? 3. Anything I said about the lower nitrogen sea could be applied to the Misty Sea biome. Instead of having there be air or water/nitrogen being below the floating islands, there could be an ultra-dense gas that is like air blocks but can't be breathed in and makes you fall very slow. I think this would give reasoning to why the islands are floating; the islands and oxygen on them are lighter than the dense gas below them, and thus float. Could just make it so that Arches link to a small island with a pool of liquid water on it. put some magma blocks in it to explain why the water's liquid. It'd just be easier and make more sense for it to connect to some place in the Misty Seas biome. The wisps would be smaller then one block floating rectangles that spawn during Frist night. They come in all 16 colors, and glow. The wisps will run away from the player, but a determined individual can catch one with a bottle. A wisp in a bottle can be crafted to make a lantern, and the lantern will emit the color of the wisp. This would allow for dynamics lighting. Wisp bottles could even be combined to blend colors, allowing for all sorts of combinations. The Frore can be tamed with a Frore staff, which can be found in the Gear. 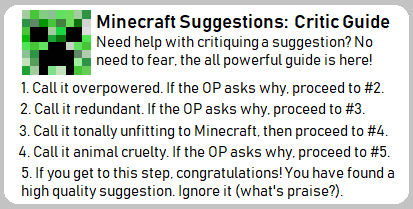 This ensures a tamed Frore is a late-game mob. But what would the tamed Frore do? Should it follow you around and attack, like the wolf? Or should it be ride-able like a horse? Both? Maybe it could have an entirely different use. Be sure to vote in the poll! Hopefully people find the poll. Also, let's be sure to credit Noxwell; he's the one that made the texture. The first is Packed Sleet, the middle Sleet, and the third Packed Blue Ice. Each are found in the First at different locations. 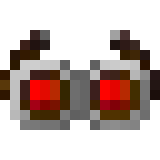 We have decided on one new drop of the Engineer (boss), the Engineer's googles, with many more in the running. Starting last Friday, we entered what we call Phase II. The general concept of the Frist has been finalized, and it is time to make everything happen. Our texture artists are working around the clock on new designs for all the crazy stuff we are coming up with (candy golem, anyone?). The model makers are creating improved models on all the mobs. And last but certainly not least, we now have coders turning the Frist into a playable mod. The Frist will remain a suggestion, but the mod will only complete what we hope to be a dimension surpassing the Aether. We are very excited to make this a reality. But it has come to our attention that there aren't many new people coming to the Frist. Our private discord isn't attracting anyone but ourselves, and that kind of takes away from the entire point of a Collaborative Suggestion. We want you to create the Frist with us. So, starting now we will continuously posting updates on the Frist Suggestion. Comment your own thoughts and ideas, everyone is welcome! If you would like to be more involved in the Frist, join our discord server. Don't get me wrong, the forums are great for discussing long and well-thought-out topics. But when you just have one random idea you want expanded discord can come in handy. There have been so many times on there where someone says a stupid sentence and it transforms into a glorious page on the Google Doc. Texture artists, modelers, and coders are all welcome to help turn the Frist into a reality as well. And if you just want to brainstorm (like me) that's fine too! You don't even have to suggest anything, feedback goes a long way. Not a very good choice of word. It was supposed to be the Engineer dropping Eye of Engineer which can then be crafted into engineer's goggle. But the eye of the Engineer is the entire thing. The Engineer instead drops a variety of inventions, increasing the incentive to explore and conquer more Gears. Seems like pretty lazy approach. It's quite weird that killing a huge laser shooting eyeball to suddenly drop a specific item that somehow fits the player's need. It's like the enderdragon dropping scale armor which somehow fits the player's body. One old idea was for following the defeat of the Engineer, the Architect (inspired benevolebt founder of the Gear) tells you it will give you its “greatest invention”. Although I suppose it dropping the same thing that with multiple uses in recipes is a viable alternative. It would make the Gear less of a roll of dice and more a clear objective to something. It has been several months since posting on the forums. Truth be told, Phase II didn't work at all that well. Our modding team sorta fell apart- some left heatedly, most simply went onto other projects, and one had a broken computer. RIP. We also finally decided upon a proper single way to enter the Frist. There will be rare "gateway" structures that spawn throughout the overworld, and anyone can enter and exit to the Frist through these gates. They can also be moved if you wish, a combination of Nether and End portals. Unfortunately, after Christmas, the Frist sorta... died. There was almost no activity for an entire month as everyone worked on their own projects. I take most of the blame- I have neglected this dimension for too long. That changes today. I am going to post a request on the modding subforum in the near future to get a proper development team going. I am also going to stop forcing people to interact with the idea courts, although I would still prefer you to be active you don't need to interact anymore. You can join the server and never post, just watching the development process if you would like. And if you are reading this in 2020 or beyond- after the Frist has been finished- you are still welcome to join the server and just read what brought us to wherever we are then. I know it is a bit inconvenient jumping from the forums to discord, but our productivity has truly increased ever since. If you are even in the slightest bit interested in this- and if you have read this post that means you probably are- visit https://discord.gg/dWvtF2m to catch up and take part in the discussion today. Did I mention Axoladdy joined us? Discussions are in motion for simplifying the suggestion temporarily to make it easy to understand to developers once we post over in the modding forum. Here is a potiential “changelog” plan for the Frist Mod’s Initial Release. More is to come. Feel free to critique the log as it is not yet final. did we get to choose a dimension, i lost some things, if we did find the theme what is it? from what i saw in the little post its an ice dimension with the steampunk "boss"/"villain"
The theme is a frozen dimension with prehistoric and steampunk influences. The Steampunk Boss is known as the Engineer. He is a giant floating eye, always watching you. He shoots a timed laser than can insta-kill, but takes plenty of time to charge so you can easily dodge. Making him really big is an interesting proposal. Perhaps we could expand upon the eye, making the entire Gear an extension of this steampunk force. So by entering the "dungeon" you are sorta entering the computer mainframe.